President Trump is waiting to see a bipartisan panel's border security compromise before he makes his next move. 'I hear they're working on something, we'll see what happens,' he said today. President Trump is waiting to see a bipartisan panel's border security compromise before he makes his next move, he indicated on Thursday. Negotiators have a week left to come up with an agreement both sides can stomach. Sen. Appropriations Committee Chairman Richard Shelby told Bloomberg after a meeting with Trump that he believes it could be done by Monday. Trump reacted optimistically to the announcement after signing a national security memorandum in the Oval Office. He said, 'I hear they're working on something, we'll see what happens. But I certainly hear that they are working on something, and both sides are moving along. We'll see what happens. 'We need border security. We have to have it. It's not an option,' he asserted. 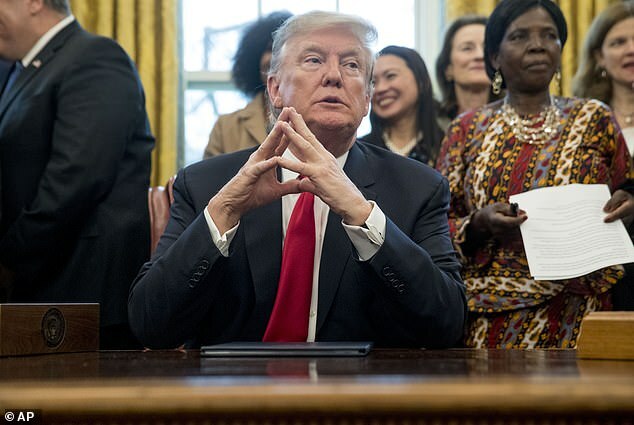 Trump is mulling over an emergency declaration to secure the funds. But it could be held up by courts for years or many months. He did not pull the trigger on Tuesday night in his State of the Union address after yo-yoing on the topic. White House Press Secretary Sarah Sanders told DailyMail.com and other reporters that he wants to see what congressional negotiators come back with earlier that day. Trump has been refusing to rule out a second government shutdown on February 15 if negotiators don't offer a border security plan that includes funding for his border wall. He also didn't rule out declaring a national emergency in order to build his barrier along the U.S.-Mexico border. 'I don't like to take things off the table. It's that alternative. It's national emergency, it's other things and you know there have been plenty national emergencies called,' he argued. 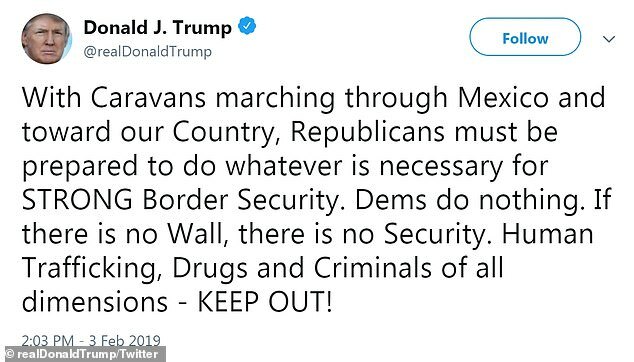 'With Caravans marching through Mexico and toward our Country, Republicans must be prepared to do whatever is necessary for STRONG Border Security. Dems do nothing. If there is no Wall, there is no Security. Human Trafficking, Drugs and Criminals of all dimensions - KEEP OUT!,' he wrote. A group of Republican and Democratic lawmakers are working on a plan to fund border security beyond February 15, which is the day funding for several government agencies runs out. The Democrats' opening offer had zero money for Trump's wall. 'This really is an invasion of our country by human traffickers. These are people that are horrible people bringing in women mostly, but bringing in women and children into our country. Human trafficking. And we're going to have a strong border. And the only way you have a strong border is you need a physical barrier. You need a wall. And anybody that says you don't, they're just playing games,' he said. He also slammed Speaker Nancy Pelosi as doing a 'terrible disservice to the people' by not funding his wall. He said she was too 'rigid' in their negotiations and 'very bad' for the country. The shutdown began when Trump demanded $5.7 billion for his border wall and Democrats refused to offer more than $1.3 billion for border security. Pelosi held firm on her stance for no border wall funding and, after the longest shutdown in American history, Trump caved and reopened the government for three weeks while negotiations on border security funding continue. He also declared the White House would 'win' in the current round of negotiations. 'President Trump’s recklessness didn’t make us safer, it undermined our security with 35 days of border patrol agents, DEA agents, FBI agents and Homeland Security personnel missing paychecks. Democrats have put forward strong, smart and effective border security solutions in the bipartisan conference committee, while the President still refuses to take a second shutdown off the table,' her spokesperson Drew Hammill said in a statement. 'There's not going to be any wall money in the legislation,' she told reporters at the Capitol. But she did say she would accept 'normandy fencing' - crisscrossed posts, lined with barbed wire or mesh - as it already exists in places on the border. 'If the president wants to call it a wall he can call it a wall,' she said. 'Is there a place when enhanced fencing, Normandy fencing would work, let them have that discussion,' she said of the bipartisan, bicameral committee working on a border security compromise plan. Trump fired back at her when he spoke to reporters at the White House later Thursday. 'If there's no wall it doesn't work. She's just playing games,' he said of the speaker. 'Nancy Pelosi will be begging for a wall,' he said. He again vowed that if there's no money for his wall, there's no deal. 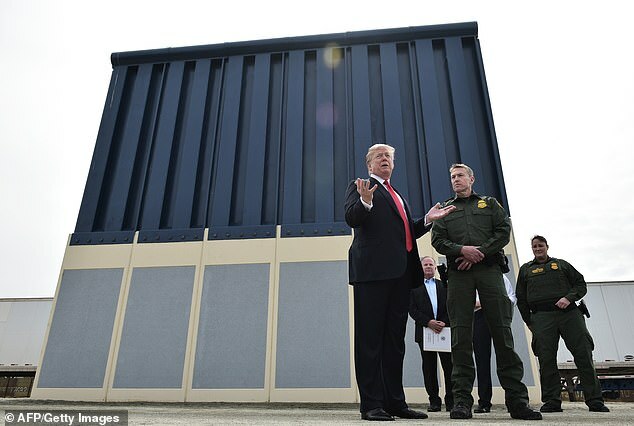 'If they don't have a wall I don't even want to waste my time reading what they have,' he said of the bipartisan committee working on a solution for border security. And he said he'd make a decision on declaring a national emergency - thus getting money for his wall that way - after the February 15 deadline for the negotiators. 'I'm waiting for February 15,' he said. And Vice President Mike Pence said the administration would 'continue to fight' for a wall. 'What the president is calling on Congress to do today is an all of the above strategy. But, all of the above includes a wall. All of the above includes a physical barrier with high density areas law enforcement communities say it is most needed. We're going to continue to fight for just that,' he said at a DEA event on Thursday. 'Thank God the government is open again,' she added. 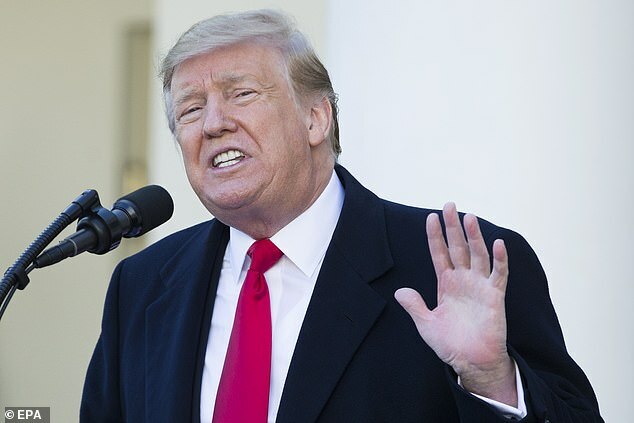 Trump caved to the speaker's demands last week and reopened the government for three weeks with legislation that did not contain any of the $5.7 billion he wants for his border wall. The legislation, however, created a bipartisan committee of 17 representatives and senators to work out a compromise on border security before government funding runs out on Feb. 15. Their first meeting was Wednesday and Democrats indicated they were open to upping their original $1.3 billion offer on border security - although they want the funds used on technology enhancements to help border agents to do their jobs. 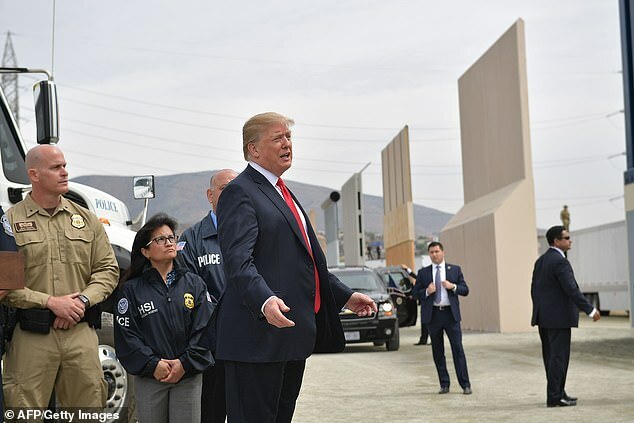 Trump, meanwhile, on Thursday dropped his offer to Democrats to call his border structure a fence or a physical barrier. A' WALL is a WALL' he noted in an early morning tweet and urged both sides to 'stop playing political games' by calling it something else. Trump continued to rage for more than an hour, telling Republicans on a bipartisan panel tasked with coming to a border security arrangement to stop 'wasting their time' on the negotiations with his political opponents. 'I've got you covered. Wall is already being built, I don't expect much help!' he proclaimed. Just this month, President Trump said Democrats could call his wall whatever want — even 'peaches' if they prefer — so long as he gets his money. He was feeling less generous by Thursday morning. 'Lets just call them WALLS from now on and stop playing political games! A WALL is a WALL!' he said. As the first day of talks among a bipartisan committee of negotiators did not produce the result he wanted, however, Trump raged on Twitter about the wall and the Mexican murder rate while watching his favorite morning program. 'Large sections of WALL have already been built with much more either under construction or ready to go. 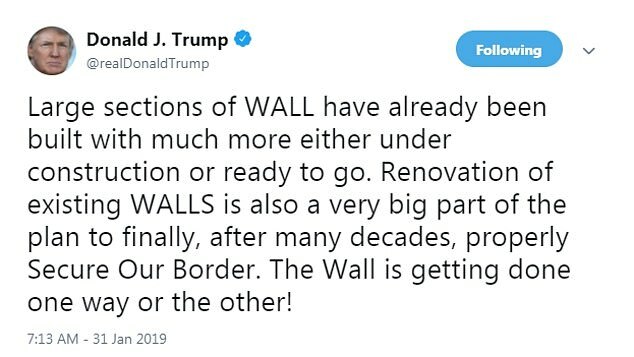 Renovation of existing WALLS is also a very big part of the plan to finally, after many decades, properly Secure Our Border. The Wall is getting done one way or the other!' he tweeted. 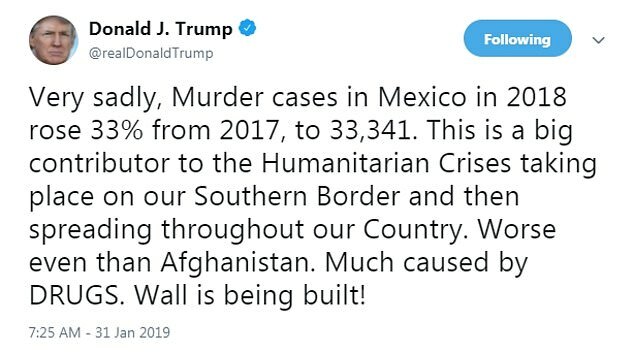 Laying the brickwork for his case that the nation is facing an emergency at the border, Trump also claimed that Mexico's skyrocketing murder rate is contributing to illegal immigration in America and the death toll is higher that of Afghanistan. 'Very sadly, Murder cases in Mexico in 2018 rose 33% from 2017, to 33,341. This is a big contributor to the Humanitarian Crises taking place on our Southern Border and then spreading throughout our Country. Worse even than Afghanistan. Much caused by DRUGS. Wall is being built!' he said. And just so it was clear what television show he was watching he tagged 'Fox & Friends' in a follow-up. 'With Murders up 33% in Mexico, a record, why wouldn't any sane person want to build a Wall! Construction has started and will not stop until it is finished,' he asserted. He correctly asserted that the country recorded 33,341 homicides in 2018, but incorrectly stated the percent increase over the year before. While it was indeed the highest rate of homicides on record, Mexico recorded a 15 percent increase in murders and not the 33 percent that Trump claimed in his social media rant. 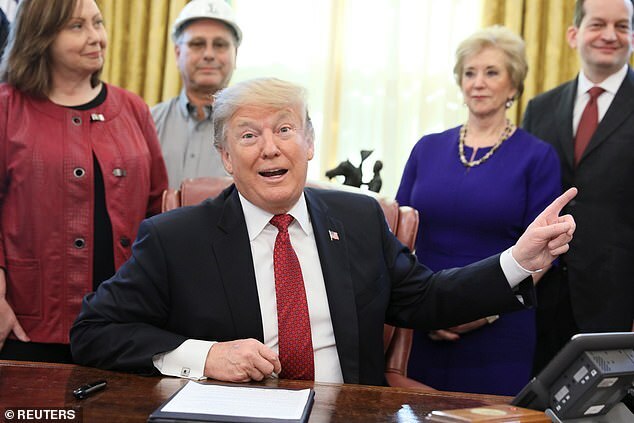 Trump was reacting to reports out of a bipartisan meeting on Capitol Hill that Democrats remain opposed to giving him a substantial amount of money for a border wall. Democrats returned Wednesday to their claim that there is no money for the barrier in their opening offer to avert another government shutdown despite his warning that morning that are 'wasting their time' if they won't fund his barrier. 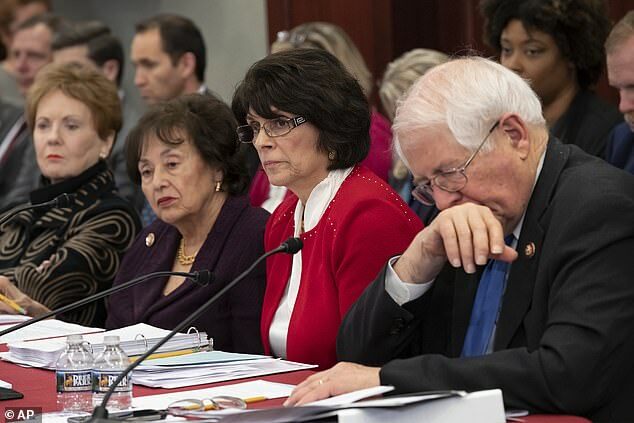 'If you're asking if there's any money for a border wall there is none,' Democratic Rep. Lucille Roybal-Allard told reporters after the first meeting of House and Senate negotiators ended. Trump said Thursday morning that he'd build the wall, anyway. 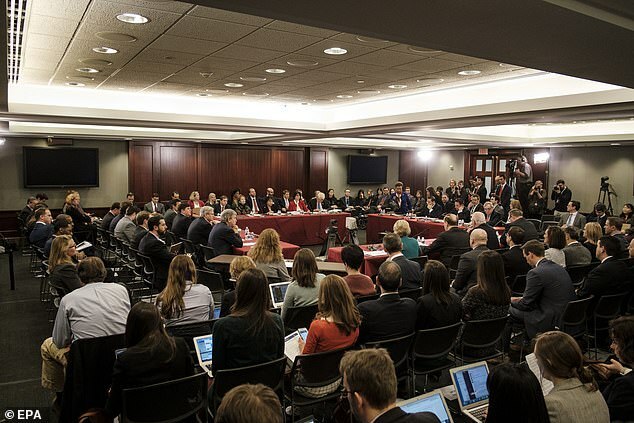 On Wednesday the 17-member bipartisan, bicameral panel held their first meeting to find a border security compromise under dueling threats: 1) a ticking clock that only gives them until Feb. 15 to come up with a plan that the president will sign to avoid another shutdown; and 2) increasingly aggressive warnings from Trump that he will tap into 'alternative' sources of revenue to build his wall if he fells that he must. House Appropriations Chair Nita Lowey appeared to brush aside Trump's threats. 'I raised three children and now I have eight grand children and I think it's best way of dealing with them is with facts and figures instead of threats,' she said when asked about the president's demand. Lowey did offer a ray of hope when it comes to compromise. 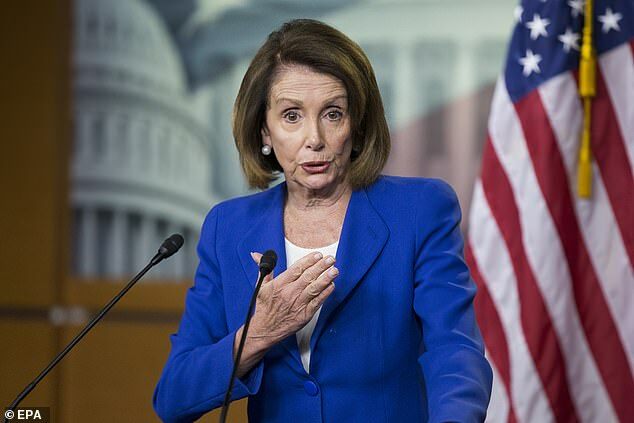 She also said the lawmakers charged with coming up with a hail mary pass over the next 16 days may take a trip to the border as part of their work. 'We've been talking about maybe taking a trip to the border but there is not much time,' she said. 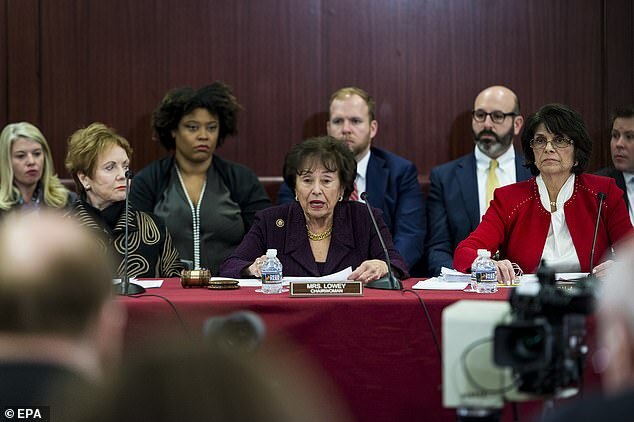 And while Democrats wouldn't commit to a wall, Lowey conceded more money would likely end up on the table than the $1.3 billion Democrats originally offered for border security. 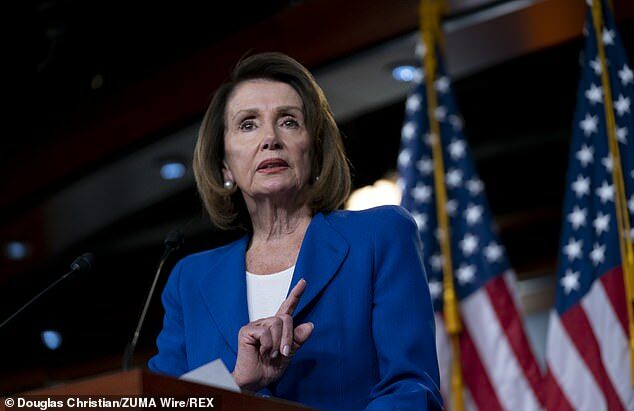 'We will expand on the $1.6 billion for border security-related programs that House Democrats have already passed in the last few weeks,' she said. But there was little enthusiasm for the $5.7 billion Trump was demanded for his border wall. Democrats argued money was limited and could be put to other uses. 'Within the limited funding available in the bill, we will be fighting for balanced investments across the Department's mission areas. And we will be pushing for a strong, but smart, border security posture, one that does not rely on costly physical barriers,' Roybal-Allard said. It was that showdown over $1.6 billion versus $5.7 billion that led to the shutdown. If the panel can't come up with a compromise Trump will sign by Feb. 15, funding is likely to lapse again for the departments of Transportation, Agriculture, Homeland Security, Treasury, Commerce, Housing and Urban Development, Justice, State and Interior, as well as the IRS, National Science Foundation, FDA and EPA. Republicans on the panel showed their support Wednesday for some type of border barrier to be used strategically. Few lawmakers used the word 'wall' but talked about building barriers where it made strategic sense. 'All sides seem to agree that border security is important. 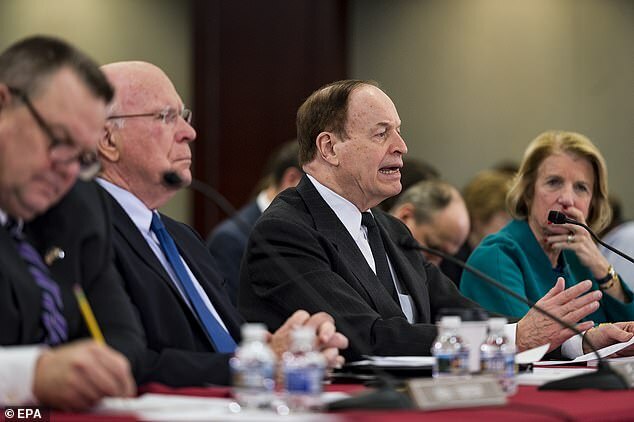 That is a good start, but it cannot end there,' said Republican Sen. Richard Shelby in his opening remarks. Republican Congressman Chuck Fleischmann did utter the word 'wall' but said he wanted one 'where barriers work' on the border. The GOP pushed for lawmakers to focus on where they agree and argued portions of a border barrier are something both parties could back. 'People, technology and barrier and we've all voted for all three,' said Republican Sen. John Hoeven. But Democratic Rep. Henry Cuellar, whose district sits on the Texas-U.S. border, dismissed the idea a wall is effective. 'Give me $100. I'll buy you a ladder and we'll take care of that wall quickly,' he said. But, before lawmakers met Wednesday afternoon, Trump put his demand on the table. 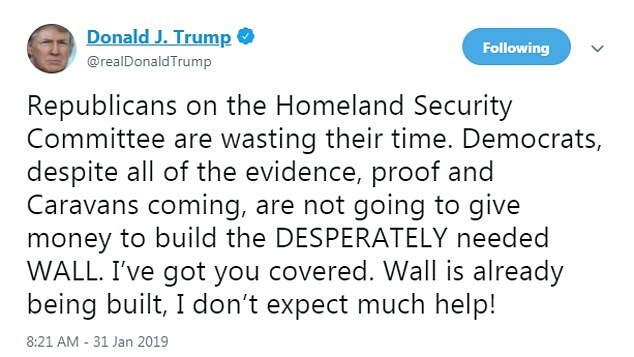 'If the committee of Republicans and Democrats now meeting on Border Security is not discussing or contemplating a Wall or Physical Barrier, they are Wasting their time!,' he tweeted Wednesday morning. 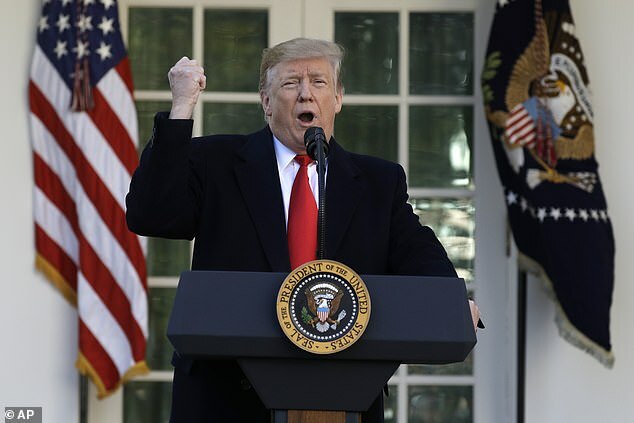 The 35-day shutdown, the longest in American history, ended Friday after Trump signed a bill to reopen the government for three weeks, backing down from his demand that Congress give him $5.7 billion for his border wall before federal agencies get back to work. Polls show people chiefly blame Trump and Republicans for the shutdown. Part of the agreement was the bipartisan panel of House and Senate lawmakers tasked with coming up with a border security plan both parties could support and Trump would sign. Speaker Nancy Pelosi, who previously said there was no chance of Trump getting his wall, punted the issue to negotiators. 'I think a conference committee can reach a good result left to its own devices without interference from anybody else. I have confidence in the appropriators,' she told CNN Wednesday morning. And Senate Majority Leader Mitch McConnell, who pressured Trump last week to end the shutdown, warned the president against triggering another one or declaring a national emergency in order to get his wall. 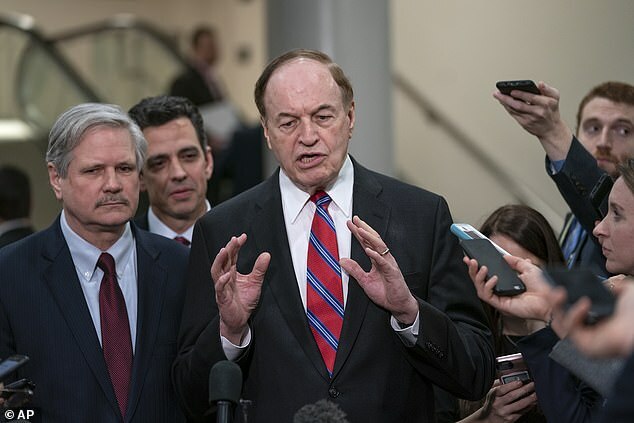 Before negotiators met on Wednesday, Shelby was asked what would happen if the lawmakers came up with a plan that Trump would refuse to sign and a veto could be overridden. 'That'd be hard to do. Nothing is impossible,' he said. White House press secretary Sarah Sanders warned Democrats on Monday afternoon that they will 'get virtually nothing' if they put Trump in the position of having to solve the border wall fight by declaring a national emergency. 'If they don't come back with a deal, that means Democrats get virtually nothing. That will make the president, and force him, to have to take executive action that does not give Democrats the things that they want,' Sanders said in her first press briefing of 2019. Meanwhile, acting White House chief of staff Mick Mulvaney said on Sunday the president is willing to shut down the government again in three weeks in order to secure the border. Mulvaney refused to answer whether or not Trump would take less than the $5.7 billion he demanded as his original price to reopen the government - the amount he needs to build a border wall.